The Watergate Scandal was a series of crimes committed by the President and his staff, who were found to spied on and harassed political opponents, accepted illegal campaign contributions, and covered up their own misdeeds. On June 17, 1972, The Washington Post published a small story. In this story the reporters stated that five men had been arrested breaking into the headquarters of the Democratic National Committee. The headquarters was located in a Washington, D.C., building complex called Watergate. These burglars were carrying enough equipment to wiretap telephones and take pictures of papers. The Washington Post had two reporters who researched deep into the story. There names were Carl Bernstein and Bob Woodward, they discovered that one of the suspects had an address book with the name and phone number of a White House official who could have been involved in the crime. The reporters suspected that the break-in had been ordered by other White House officials. In a press conference on August in 1972, President Nixon said that nobody on the White House Staff was involved in the crime. Most of the public accepted Nixon’s word and dropped the questioning. But when the burglars went to trial four months later, the story changed rapidly from a small story to a national scandal. It ended only when Richard Nixon was forced from office. 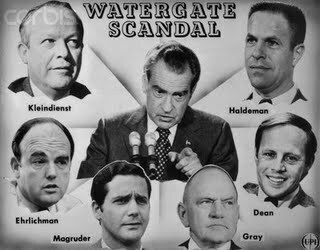 Watergate was connected to Vietnam, it eventually exposed a long series of illegal activities in the Nixon administration. Nixon and his staff were found to have spied on and harassed political opponents, planned contributions to the campaign, and tried to cover-up their illegal acts. These crimes that they did were called the Watergate scandal, named after the building that it happened. For years Nixon was carrying on the crimes and they were not noticed until now. 1969 was the really date in which Watergate was really beginning. It all started when the White House staff made up a list called “enemies list”. Nixon had enemies which include 200 liberal politicians, journalists and actors. Most of these people made a public speech against the Vietnam war. Nixon’s aides formed a conducts tax audits on these people that he thought were enemies. He also had agents find out secret information that would harm them. Nixon was always worried about govt. Employees revealing secret info. To the news paper or any sort of press. The presidents agents helped him by wiretapping phone lines that belonged to reporters in order to find any revealing some material. Nixon was so worried that during the Cambodia bombing he had to wiretap his own staff members. On June in 1971, The New York Times formed work that was published about the history of the Vietnam War, these were known as the Pentagon Papers. They got the information from secret government papers. The papers blamed the policies that were formed and caused the beginning of the war in Vietnam. Daniel Ellsberg, a former employee , gave the documents to the paper. Nixon became very angry by their publishes. Nixon tied to make Ellsberg’s actions a form of treason, but he was not content to take him to court. Instead he made a secret group of CIA agents they were called the “plumbers” this is a name made up because they cover up leaks, such as the pentagon papers, that could hurt the White House. While they were searching for info. They found Ellsberg’s psychiatrist’s office. They discovered nothing wrong. The next time the plumbers are involved is the next election. Nixon was always worried about having enough votes for the election in 1972. Nixon was concerned that Edmund Muskie of Maine would win because he was the strongest Democratic candidate. Hoping to wipe out Edmund from the competition, the plumbers began to play a bunch of so-called “dirty tricks”. They issued make-believe statements in Muskie’s name and told the press false rumors about him, so that they could publish it to the public. And most of all, they sent a letter to the New Hampshire newspaper starting that Muskie was making mean remarks about French Canadian ancestry. All of these aides forced Nixon to begin getting above Muskie in the elections. Overall, the Democratic nomination went to George McGovern, a liberal senator from South Dakota. His supporters included many people who supported the civil rights, anti-war, and environmental movements of the 1960s. McGovern had fought to make the nomination process more open and democratic. Congress had also passed the 26th amendment to the Constitution allowing eighteen-year-Olds to vote. As a result, the 1972 Democratic Convention was the first to include large numbers of woman, minorities, and young people among the delegates. McGovern’s campaign ran into trouble early. The press revealed that his running mate, Thomas Eagleton, had once received psychiatric treatment. First McGovern stood by Eagleton. Then he abandoned him , picking a different running mate. In addition, many Democratic voters were attached to Nixon because of his conservative positions on the Vietnam War and law enforcement. The final blow to McGovern’s chances came just days before the election, when Kissinger announced that peace was at hand in Vietnam. McGovern had made his political reputation as a critic of the war, and the announcement took the wind out of his sails. Nixon scored an enormous victory. He received over 60 percent of the popular vote and won every state except Massachusetts. Congress, however, remained under Democratic control. On January of 1973, two months after Nixon had won the presidential election, the misdeeds of Watergate began to surface. The Watergate burglars went on trial in Washington D.C.., courtroom. James McCord, one of the burglars , gave shocking evidence. A former CIA agent who had led the Bay of Pigs invasion of Cuba in 1961, McCord worked for the Nixon re-election campaign. McCord testified that people in higher office had paid people “hush money” to the burglar who were involved in Watergate. With the money they were supposed to conceal White House involvement in the crime. After they investigated for a while, they quickly found out that the break-in was approved by the attorney General, John Mitchell. Even thought John Mitchell was one of the most trusted advisors, Nixon denied to know anything about the break-in and cover-up of the crime. The public found out not to soon that Nixon was not telling the truth. The public also found out that Nixon had ordered his aides to block any info to the investigators. The White House also tried to stop flow of the investigations, because they were afraid that it would uncover very important secrets. Nixon would not appear at the congressional committee, complaining that if he were to testify it would violate the separation of powers. Even thought that idea doesn’t appear in the constitution at all. It was a developing tradition to protect the president. This made people feel that Nixon was abusing executive privileges just to cover-up his crimes. When Nixon had no possible way of protecting the White House staff he fired them. Such as when he fired two of his aides, Bob Haldeman and John Ehrlichwan, because they were on the line of being charged for the crimes. But they were still convicted of conspiracy, obstruction of justice, and perjury. On may of 1973, they broadcasted the hearings on television to millions of people, the public felt that it was very gripping and made them distraught. An official told the court that Nixon had tape-recorded all the conversations on tape. Nixon had hoped these tapes would one day be used by historians to document the triumph of his term, instead they were used to prove that he was guilty. The president refused to release the tapes, claiming the executive privilege gave him the right to keep his record private. That caused him to go to court, before it was decided, Vice President Agnew was charged with income tax evasion. He was also charged for accepting bribes and exchanging for political favors. Agnew resigned because of the charges on October of 1973. He was only charged of tax evasion and the others were dropped. This scandal was not connected to Watergate, but it put a lot of stress on Nixon. Nixon nominated Gerald Ford in place of Agnew. Ford did very little to salvage Nixon reputation. A couple of days after Agnew resigns, the federal court made Nixon hand over the tapes. Nixon refused, and Cox ordered him to, but Nixon had his attorney fire him. Cox was an idle to Richardson, because he was his professor in law school. Richardson refused Nixon’s order and resigned. President Nixon then ordered the deputy Attorney General to fire Cox. This massive event was known as the Saturday Night Massacre. Many people of the nation felt that Nixon’s blocking of the judicial process, a proof of guiltiness. People mailed Congress many telegrams saying to begin impeaching proceedings against the president. So the House Judiciary Committee did that, and fired him. President Nixon had remained cool and still acted as if he was innocent. At a press conference on November, his famous quote was ” I am not a crook”. He avoided questions and was agitated. People that day who were watching television knew that Nixon was gonna be in hot water. Internal Revenue Services also discovered something that could harm Nixon. They noticed that in 1970 and 71′ he had only paid $800 in taxes when he earned over $500,000. The nation found out that he also used public money to fix-up his house in Florida and California. Nixon keep on refusing to give up Watergate tapes. Then, on April 1974, he gave out the transcripts of the tapes. He edited the transcripts and tried to cover up the crimes, but it did not work and it gave Nixon a bad reputation. The Committee voted to bring impeachment charges in July against Nixon. The first one said that the president knowingly covered-up the crimes of Watergate. The second said that he used Government Agencies to violate the Constitution of the U.S.. The third asserted that he would be impeached because of the withholding of evidence from Congress. Shortly after the house committee voted to impeach the President, the case want to the entire House for a final say. Nixon at this point still counted on the public to back him out , because of some that doubted his involvement. A decision came out a couple of days after the vote for Nixon to release the tapes that involved the Watergate. Nixon at this point had to follow through with it and hand over the tapes. Nixon for a long time claimed that he had no idea of the Watergate scandal until John Dean told him on March 21, 1973. The tapes showed that Nixon was a true liar, and not only knew about it, but ordered it. Because of this Nixon met with A group of republican leaders and they tried to convince him to resign from office. He did just that on August 9, 1974, Nixon broadcasted that he was resigning to the nation. This meant that President Richard Nixon was the first president of the United States to resign from office. The nation was shocked after this whole scandal by the way Nixon had lied to the public and abused his own powers. This lead most of the public never to trust a president as they did before, because of the massive secrecy in the Government. But the best part is that the country did survive the trauma, which is wonderful. The day of Nixon’s resignations Gerald Ford was sworn in to presidency. you are right. these two movies are a must watch. thanks jay. good job naveen! i will also try to drop in some useful comments sometime soon….adios! I’ve always wondered why Nixon et al felt the need to gain an extra edge by bugging the DNC headquaters. Didn’t they realize what a small chance McGovern had of pulling off the upset? If anything they were fortunate that the candidate was McGovern. If Wallace hadn’t have been shot and forced to exit the race McGovern may never have won the nomination. I suppose it’s a testimant to hubris and paranoia. The tensions between the Democrats and the Republicans during the 1972 elections was justified. I believe that George Wallace was a tough contender compared to George McGovern against Nixon. But Arthur Bremer’s attempt to assassinate Wallace left Wallace paralyzed and this forced him to end his campaign. Wallace did well in south and north and could have led a forceful campaign. This i believe helped McGovern gain an upper hand later. But this is what i believe politics is famous for apart from its ideal definition. Nixon and the republicans wanted to win the rat race for presidency by hook or crook and they tried in every manner. Do you think the powers that be at the Democratic party would have allowed Wallace to take the nomination? Wallace, after all, was more of a Republican running as a Democrat. Wouldn’t they have thrown all their power behind Humphrey to see that it didn’t happen?